Ravi Jadhav who understand the nerve of marathi audience is producing an upcoming marathi film with Krishika Lulla of 'Eros International' titled "& Jara Hatke"; It is a touching story of a family caught in the whirlpool of emotions; a dilemma to choose between the mind and the heart. It is a story of a Mother and Daughter and father and Son. 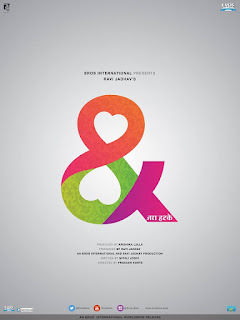 "&" Jara Hatke the title defines the connection between the infinite emotions of individuals and how that affects their life. An emotional family drama is written by "Mitali Joshi" and directed by "Coffee Ani Barach Kahi" fame director "Prakash Kunte". It is Kunte's second outing as a director with "Ravi Jadhav Films". Film stars Indraneil Sengupta an Bengali actor, who is making acting debut in marathi movie, Mrinal Kulkarni, Siddharth Menon, Shivangi Rangole, Spruha Joshi and Sonali Khare. While music for the film is composed by Aditya Birwadkar. Movie will be released in 2016.